Amidst reports that Prime Minister Narendra Modi took the “lead” in paying tribute to Kanu Ramdas Gandhi, grandson of Mahatma Gandhi and a former NASA scientist, who breathed his last in a private hospital in Surat on Monday evening, facts have come to light suggesting Modi's promise to “help” Gandhi never materialized. Dhimant Badhia, a close friend of Gandhi, has told this correspondent that upon return to India, Gandhi and his wife, Shivalaxmi, “kept moving from one place to another as they have no place of their own here. They spent short spells in ashrams or inns, and at one point they were compelled to spend six months in New Delhi's Guru Vishram Vruddha Ashram." Finally, Badhia revealed, “a Union Minister got in touch with Gandhi and made him speak to Prime Minister Narendra Modi, who was sympathetic and offered all help to the couple.” However, Badhia added, the couple “never heard” from either the Prime Minister's Office or the Gujarat government, which also was in know of Gandhi's state of affairs. According to Badhia, on October 22, Gandhi suffered a massive heart attack and brain hemorrhage “which left half his body paralysed and he lapsed into a coma from which he never recovered.”Ailing since the past few weeks, he was 87, and is survived by his 90-year old wife Shivalaxmi. 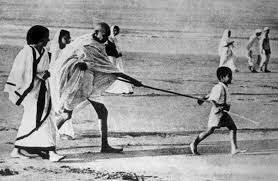 As a small child, Kanu Gandhi was the little boy that walked ahead of Mahatma Gandhi who prodded him with his stick on the beaches of Gujarat's Dandi village during the historic Salt Satyagraha of March-April 1930. Based in Ahmedabad, Badhia, an old friend and grandson of a close associate of Gandhi, arranged for some monetary help for the ailing Gandhi, and had recently given Rs 21,000 from personal resources. The Radhakrishna Temple got Gandhi admitted to the Shiv Jyoti Hospital nearby. They also took care of his 90-year old wife, Shivalaxmi, who is practically deaf and suffers from other old-age related ailments, Badhia said, unsure of her fate now. The going was not particularly good for the elderly childless Gandhi couple since their return after a four-decade long stay in the US in 2014, including Kanu's career of over 25 years with NASA. Decades ago, the bright Kanu was handpicked by the then US Ambassador to India, John Kenneth Galbraith for studies in MIT, US. Later, he worked with NASA and the US defence department on wing structures of fighter aircraft, while Shivalaxmi was a professor and researcher in Boston Biomedical Research Institute. Soon after reaching Surat, he suffered the heart attack on October 22 accompanied by a severe stroke which left half his body paralysed; he lapsed into a coma and remained on life-support systems. Shivalaxmi remained by his side most of the time, as also Rakesh, an aide deployed by the temple authorities round-the-clock to serve Gandhi. Gandhi's very aged sisters – Usha Gokani from Mumbai regularly enquires after his health and another Bengaluru-based sister, Sumitra Kulkarni, a former Rajya Sabha Member, visited him recently. Badhia said the duo had even offered to bear Kanu's medical expenses but the temple authorities declined, saying they were repaying the debts of Mahatma Gandhi's services to the nation.